These apple butter bacon scones are stuffed with fresh apples, salty bacon pieces and made with apple butter to keep them nice and moist. Perfect breakfast on a crisp cool fall morning. 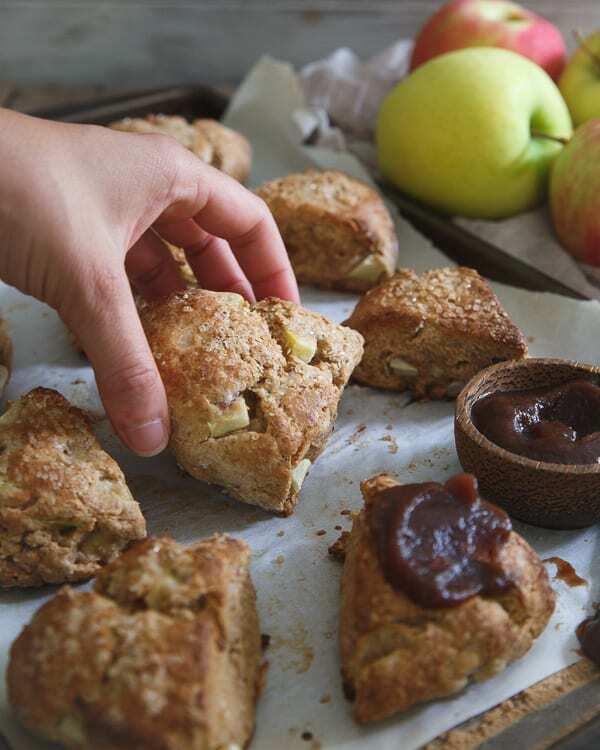 *This post was originally published 9/24/2015, it’s been updated to include a video on how to make these Apple Butter Bacon Scones in partnership with Musselman’s. They’re really one of my favorite baked goods for fall, hope you try them out! Scroll down to the recipe card to watch the video. A couple of weeks ago when Julie was visiting over Labor Day weekend, we decided to go antique hunting/thrifting for blog paraphernalia. Not that my entire dining room isn’t already filled with things solely used for online photography including two substantial pieces of furniture to house them all, but I figured why not add a few things to the collection? *This post is sponsored by Musselman’s. All content and opinions are my own. Check out more delicious apple butter recipes on their site. So, off we went to a bougie (<–obsessed with this new to me urban dictionary word because it just perfectly describes so many things in life) little town called Rhinebeck with it’s cutesy, overpriced eclectic store fronts and antique shop lined streets where people (us) get suckered into paying $8 for 3 of the tiniest little chocolates you’ve ever seen. Except right smack in the middle of this town that could otherwise be straight out of the movies, there’s this complete hill-billy house that puts the show Hoarders to shame. The fact that there’s even any room to pull into the driveway and park gives you an idea of just how much STUFF there is outside of this house/antique (a very liberal use of the word) shop. Things are literally just strewn about outside where they stay no matter what the weather until some crazy person decides they need that window frame, license plate or glass jar from 50 years ago because they saw something on Pinterest that they want to try. A few minutes later after a run in with one of the family members on the porch who gave us what seemed like a murderous glare for poking around his property, we found ourselves in a small detached building digging through a box of silverware and knives asking each other if our tetanus shots were up to date. A nervous negotiation later, I walked away with the metal butter knife in these pictures. It took about 10 minutes, a lot of soap and the hottest water my hands could stand before I even wanted to put it near food but once this thing was cleaned up my first thought was that it needed a rustic fall baked good to make it’s internet debut. 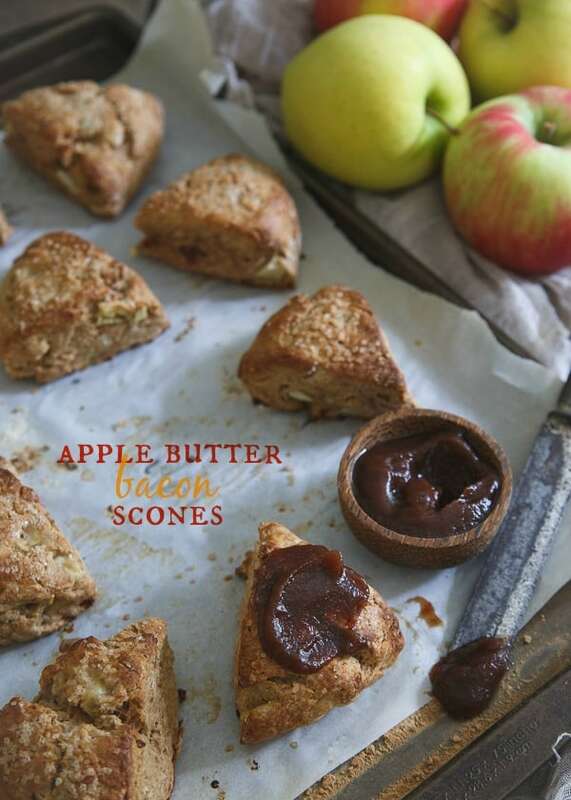 So here we are with these apple butter bacon scones, a rustic baked good if ever there was one. I feel like apple butter is the unsung hero of fall. Everyone is all “apple pie!”, “applesauce!” and not enough people are like “yo, apple butter is where it’s at” because let’s be honest, it is. With it’s dark, deep buttery apple flavor, apple butter puts applesauce to shame. 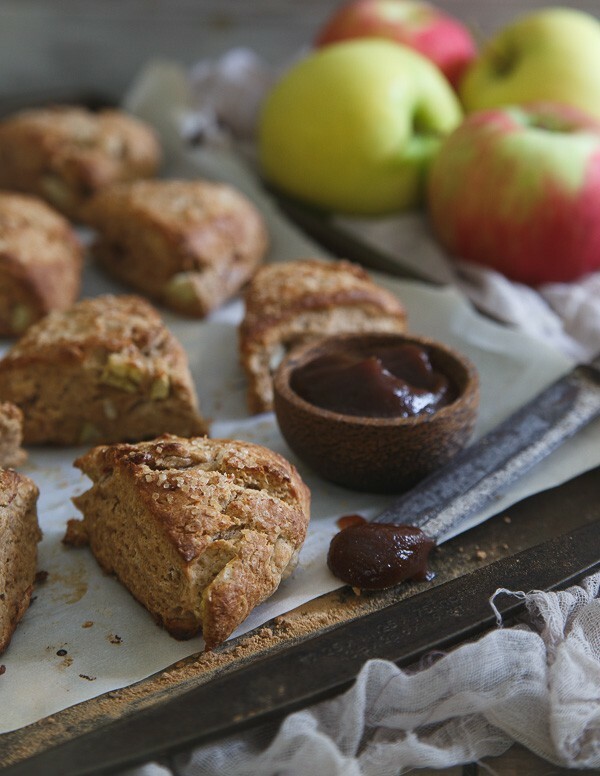 These scones get a double dose of apple with both fresh chopped apples as well as Musselman’s apple butter inside. The apple butter keeps them nice and moist as a baking ingredient and the contrast of the fresh apple with the salty pieces of bacon is what fall baked goods dreams are made of. They really could go either way, savory or sweet, given the ingredients (apple butter is cool like that) but I chose to top them with some cane sugar to go the slightly sweet route. Slather them with some more apple butter (tetanus knife optional) before serving and I’m pretty sure any and all thoughts of apple pie and applesauce will be a distant memory. Don’t miss 10 ways to use apple butter for even more sweet and savory ways to enjoy it! Combine the flours, sugar, baking powder, salt and spices in a large bowl. Add the butter to the bowl and work in with a fork, pastry cutter or your fingers until a crumbly consistency forms. Add the apples to the flour mixture and stir to combine. Whisk the eggs, apple butter and vanilla together in a medium bowl until smooth. Add the wet mixture to the dry and stir until combined and dough becomes sticky. Fold in the bacon until just combined. Form half of the dough into a circular shape on the parchment about 5-6 inches in diameter. Repeat with the other half of dough and place on the same baking sheet. Cut each circle into 6 slices using a sharp knife and gently pull each piece out and away from the center of the circle to create some space between them. Place the baking sheet in the freezer for 20-30 minutes. Remove baking sheet from freezer, brush the top of each scone with the milk and sprinkle generously with the turbinado sugar. Place in the oven and bake for 15 minutes until golden brown around the edges. Remove from oven and let cool on the baking sheet for 5 minutes before serving warm. Bacon and apple are so surprisingly amazing together (I mean, duh, everything is good with bacon!)! These look simply mouthwatering! I’ve gotta try them! Love thrifting for fun stuff for the blog! I have too much, but I am with you what is one more thing… or two. Love the bacon and apple combo. Can’t wait to give this recipe a try. Oh the things we’ll do for blog props :) I’d say apple butter is way better than applesauce! And putting bacon in these was genius! I couldn’t agree more apple butter puts applesauce to shame indeed! 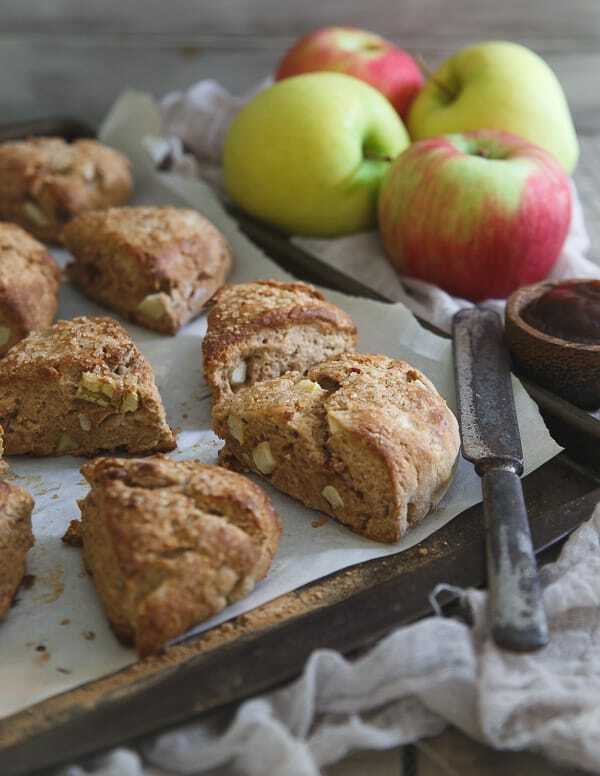 These scones with their double dose of apples AND bacon sound so incredible! Apple butter is one of my kids favorites (mine too!) These scones are fall perfection with a touch of bacon…yum!! Bacon in scones sounds like just about the best thing ever! Love the applesauce in it too. This look good; but I have a question. I’m probably missing something, but could you tell me what temperature and how long to bake them? Would have never thought of putting bacon into scones, but it sounds amazing! Especially with that thick apple butter smeared on top. So autumnal! Mmm, all my faves! These look fantastic! Amazing! And these pictures have me drooling! Is this apple butter in all grocery stores? I need to get my hands on it! YUM! Oh, the adventures us food bloggers will go to for good, rustic props :) I’m surprised you walked away with just a butter knife, to be honest! You have way more restraint than I do. I can think of no better first use for that cute knife than spreading Musselman’s on these glorious scones! Oh man these look incredible! I love the idea of apple and bacon together, the perfect sweet and salty combo! Wow, I’m digging the flavors in this and bacon, come on now…I love it!! Apple butter and bacon are a magic combination! I love going to those antique places that are just jam packed with hidden treasures! 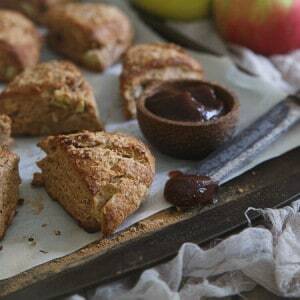 I love apple butter and these scones look delicious! I had to read the title for a few times, wow! -Apples & bacon sounds like an inspiring and interesting combination, yet such a delicious one! I love the combination of flavors in these sweet & savory scones! Pinning! Apple butter AND BACON!? This is the salty-sweet breakfast of my dreams! I want! FYI… Your “Bake Time” at the top of the recipe reads 45 Minutes… my first batch came out blackened!! I noticed after that it says 15 in the recipe itself. May want to fix ot eliminate that top section. I’m so sorry about that. There’s clearly an issue with my recipe card as it’s input correctly on the backend, it’s just displaying incorrectly (prep and cook time are reversed) on the site. My apologies, looking into it now to fix this. Can you use all purpose white flour, instead of wheat. If so same amount? Can these be made a day ahead? We’re going to be having a house full of people and I am the only person who knows how to cook. Yes, I’d suggest reheating in oven or toaster oven before serving. This recipe looks very good, but could you please give us the measurements in grams instead of cups and ounces?